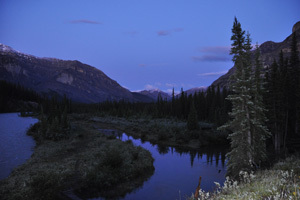 The Outpost is a remote backcountry lodge nestled in the majestic Canadian Rockies. 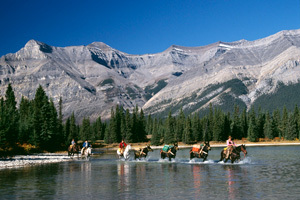 We offer Horseback Vacations bordering Banff National Park. A little over 50 miles/80 kilometres north of the Town of Banff and just over 50 miles/80 kilometres west of Sundre, Alberta, The Outpost offers turn of the century charm, with all the comforts of home! With over 50 years of experience in mountain horseback riding, guiding and outfitting, we provide both memorable and safe authentic western horseback vacation packages. 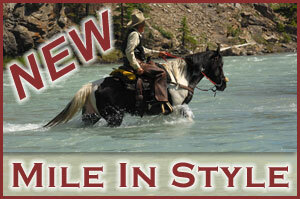 It is perfect for riders and non-riders alike. Whether you are looking to recharge with a little rest and relaxation, or explore the splendour, serenity and solitude found in the mountains, The Outpost provides the right getaway and horseback vacation. You can do as little or as much as you want! Open each year from the beginning of May until the end of October, we are an incredibly civilized way to leave civilization! Choose from an all inclusive package like our Horseback Adventure with guided trail riding and access by North America’s only authentic working stagecoach, to an overnight bed, bale ‘n’ grub where you bring in your own horse! If you are intimidated by the four-legged critters, you can hike in on our Hiking Stay packages. For the fitness buff and health conscious, try our Wild West Spa Escape. 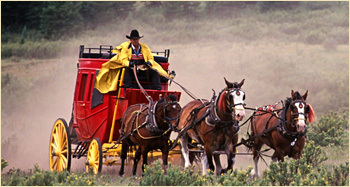 Knowledge seekers can experience the Alberta wilderness while learning about Tack Fitting, Packing and Driving Teams in our Equine Educational Holidays. Take a look to see what exciting options we have to offer you! If you are looking for breathtaking mountain vistas, wide open spaces and have a longing for simpler times, we have the Horseback Vacation, Guest Ranch and Dude Ranch Vacation you have always wanted, but could never find! Unplug, Unwind, and Just be! LIVE IN THE NOW…BUT LIVE IT NOW!